It’s probably safe to say that Nico Slate, associate professor of history at Carnegie Mellon University, never imagined his historical research would inspire dance performances. 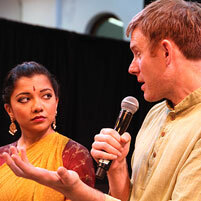 But that is exactly what happened at the Smithsonian’s recent pop-up event, “CrossLines: A Culture Lab on Intersectionality.” Renowned bharatanatyam dancer and choreographer Anjal Chande reimagined Slate’s work on the anti-racist solidarities between South Asians and African Americans. “It was deeply moving to see the history I study brought to life in the form of such a powerful and intricately expressive work of art and especially meaningful to see audiences full of young people inspired to learn more about the long struggle against racism throughout the world,” said Slate. This was the first time the Smithsonian’s Asian Pacific American Center hosted CrossLines, which brought together more than 40 artists and scholars. It was designed to engage the public in an experience that illustrates the rich diversity of Asian Pacific American stories while celebrating Asian Pacific American Heritage Month. The event also marked the first time since 2004 that the Smithsonian’s Arts and Industries Building was open to the public. CrossLines’ curator Adriel Luis described the event as highlighting work from culturally diverse artists in a wide variety of media. “Museums are known as places that segment. This is about crossing lines between different communities and different forms of art,” Luis told the Washington Post. In particular, she focused on the life of South Asian feminist and anti-colonial activist Kamaladevi Chattopadhyaya. Bharatanatyam is a solo dance that depicts various characters through swift turns and movements that follow the narrative of a song or story. There were four performances of “Out of the Shadows, A Colored Solidarity,” and Slate joined Chande onstage for audience Q&A sessions after each one. Most questions focused on the larger history that informed the piece and the process of creating a hybrid historical dance piece. “I left the event grateful for the opportunity to collaborate with such a talented choreographer and dancer, and to share the history of anti-racist solidarities with the audiences and the other artists at CrossLines,” said Slate. CrossLines showcased other visual and performance art by groups including D.C. artist SUPERWAXX, whose collective works are heavily influenced by pop culture and street art; Wooden Wave, a Hawaiian duo whose interactive Treehouse Mural served as the entrance piece to the event; and a California-based trio of artists called People’s Kitchen Collective, who created a mock pharmacy counter where they dispensed edible “remedies” and invited participants to share family healing practices. Slate and Chande are planning to bring their collaboration to new venues worldwide — including CMU — and are exploring how the piece can be expanded to highlight other key figures and moments in the history of connections between African American and South Asian freedom struggles.